– Harry S. Truman, Grand Master’s Address, 1941. MWB Harry S. Truman served as Grand Master of Masons in Missouri and as President of the United States. He was committed to the mission of the Masonic Home through his leadership and his financial support. The Truman Club honors that commitment. What is The Truman Club? The Truman Club recognizes donors who support the Masonic Home with ongoing, annual giving. 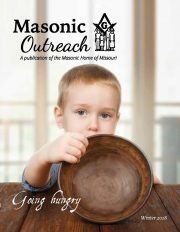 The support of Truman Club members is essential for the Masonic Home to help those in need. During Fiscal Year 2018, Truman Club members contributed more than $203,000 to assist individuals in need statewide. To be eligible for membership, an individual must make an annual commitment of at least $100 in contributions during the calendar year. Membership is renewable each year on January 1. The Truman Club recognizes both annual and cumulative giving to the Masonic Home. An indivi­dual’s cumulative giving since January 1, 2004 is calculated to determine eligibility for the Truman Giving Societies. Once individual cumulative giving since January 1, 2004, reaches $1,000, you will become a member of the first Giving Society and receive the distinctive Harry S. Truman bust symbolizing the enduring legacy made possible by your giving. As a member of The Truman Club, you know that your collective financial support facilitates the transformation of Masonic tenets into reality. Members are invited to attend The Truman Club’s annual, exclusive dinner each September, where we recognize club members and raise funds to benefit the Masonic Home’s Outreach Programs. Members whose cumulative giving reaches $2,500 or more will be permanently recognized for their contributions on the Truman Club Donor Wall, located at the Masonic Complex in Columbia. How Can I Join The Truman Club? We invite you, Brothers, Sisters, and friends of the Masonic Home, to join The Truman Club. To join, contact our Annual Giving Officer at 800-434-9804. — Clarence A. "Buzz" Barrows Jr.